Funspot is the largest arcade in the world, founded in 1952 by Bob Lawton who still works here every day. Funspot provides quality entertainment in an atmosphere right for the whole family and its array of fun is continually growing. 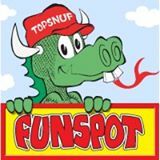 Funspot offers over 600 games, including 300 classic arcade games, a 20 lane ten pin & candlepin bowling center, cash bingo, outdoor & indoor mini-golf, a restaurant, a tavern and more!